Mid whale watching season 2014 Getaway Sailing and the New Zealand Herald spent some time together with the Humpback whales on the ocean in front of Surfers Paradise on the Gold Coast. Anne Gibson was our guest and the Humpbacks did not disappoint. We were treated to a spectacular show of breaching, pectoral slapping with a mother and calf. The following story is written by Anne of her time spent on "Eau De Vie" with the whales. In the fourth story in a series on Queensland, Anne Gibson keeps her eyes peeled for a breach. "You're in whale country," announces Darryl Franklin as he glides his 11m yacht, Eau de Vie, into the Tasman across a dramatic backdrop of Surfers Paradise high rises. "We're looking for a blow. If you think you see one, keep looking," he advises, heading from Southport on Queensland's southeast coast towards South Stradbroke Island. "That'll save us half an hour," predicts the optimistic Franklin, also an avocado farmer, commercial pilot, biologist and owner of a day spa, who runsGetawaysailing. The company has a point of difference: the big, wave-piercing commercial tour businesses take well over 100 people, stacked on multiple decks, but Franklin takes no more than six on privately skippered, day-long charters, adding an edge of exclusiveness. 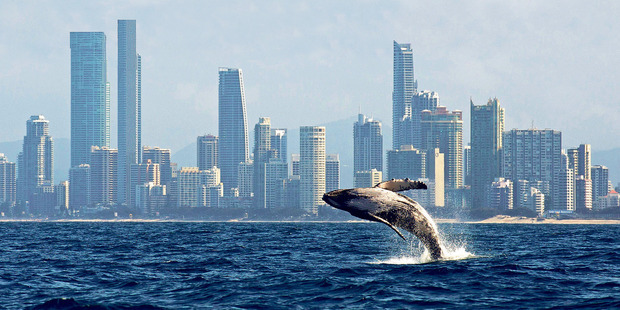 Being able to switch the engine off and quietly glide alongside the humpbacks so low down and close to the water provides an experience he says no other Gold Coast tour operator can when it comes to whale-watching. "And 90 per cent of the time the whales are there, we're by ourselves. It's totally different. This is a private experience," says Franklin, who also runs another unusual yachting adventure: wedding proposal cruises. "I've got a big white spinnaker with 'Will You Marry Me?' written in red letters on the white sail," he says. Franklin takes out couples, often at sunset, and sometimes even has to hold the ring while the suitor goes down on one knee. He unfurls the sail with the auspicious words and the bride-to-be gets the surprise of her life - and a photograph to beat all others. Back to those elusive whales, Franklin guarantees sightings from May to November, explaining that in early August about 200 whales will be in the gulf, staying below the waves for an average of three to 10 minutes, but often remaining down for around six minutes, then breaching. It is this precious moment we're waiting for but none of the boats is allowed closer than 100m to the whales, so the skippers perform a maritime balancing act. They move to where they know the whales will shortly breach to give tourists the best view but stay far enough back to comply with regulations. Humpback whale numbers are growing 5-10 per cent annually, Franklin says. "There's no doubt the volume is increasing and there are many more juveniles now, too." These magical mammals are 10m to 15m long, often accompanied by a calf of 3m to 3.5m long, moving between the Antarctic and the equator, many swimming all the way north but also often stopping around Sydney or Tonga. "This is the whale super-highway," says the skipper when we are around 10km from the coast. "The mother can produce 180 litres of milk a day." Franklin has underwater listening gear with deck speakers plus headphones so guests can hear what he terms "whale speak". "Listen to the live whale songs through our underwater hydrophone as you watch their charismatic antics on the water," his advertising says. But his GoPro experiment is yet to produce a visual link from camera to computer so guests can view the whales beneath the surface. First comes a dolphin, checking out the yacht just off the coast, then the first sighting is about 10 minutes into the half-day morning trip. All on board are quiet, scanning the horizon, borrowing the binoculars, cameras at the ready, some near the helm but others in beanbags at the bow. Luck is not with us. The sky is overcast, the ocean choppy and sea sickness is gradually taking its toll as the yacht rocks and rolls. Every whitecapped wave appears like a whale but, without the sun, the sea is inky and ominous. Conversation lapses and the spotting becomes a chore. Suddenly, at 11am, the radio emits screams, laughter, squeals of delight. Another vessel in the area is alongside two humpbacks, breaching just off the spit at Southport. Quick, it's almost all the way back to base for us, motor on, across the waves. Two other vessels - Whales of Paradise and Gold Coast Adventures - join Eau de Vie at the spot and bob alongside each other, around 300 people now quiet and gazing down. Then, the magic happens: first, the blow, then the intriguingly strange multicoloured back arcing slightly out of the water, then under again, repeating that curvy motion a number of times, tail last to disappear. Then, finally the tail is way up before that final dive towards the bottom and we stare at the spot, envisaging the gentle giant of the sea with its head down and fins on the side, gracefully moving beneath the waves, maybe even under our boats. 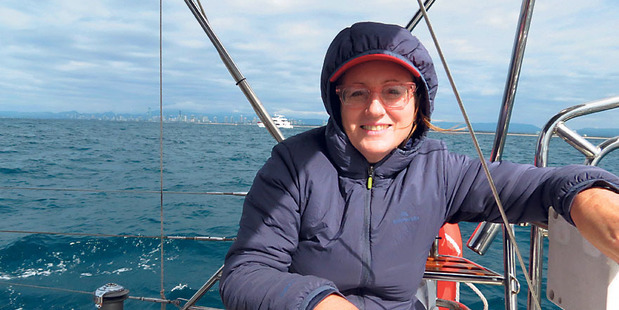 Franklin has been on a Kaikoura whale-watching boat and marvelled at the depth of the Pacific and the snowcapped Kaikouras but says sightings on the Gold Coast are so much more frequent and therefore satisfying that he prefers the Aussie experience. For the next 30 minutes, the three craft track the two magnificent humpbacks heading south, breaching many times, tails in the air above the GC towers, arcing above the waves, gliding down and away, all the time so near us, so wild and beautiful. The writer was a guest of Gold Coast Tourism Corporation and Hilton Surfers Paradise.